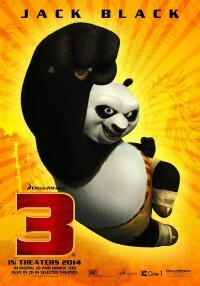 By Rachael Arnts–Everybody is kung fu fighting to see DreamWorks Animations’ third installment of Kung Fu Panda. The film starring the voice talent of Jack Black was released this past weekend. According to Box Office Mojo, the film made over $41 million in its opening weekend. The PG-rated animated action/adventure film is the next chapter to the story of the clumsy, noodle-loving panda Po, who was chosen as China’s Dragon Warrior. In this new film, Po is finally reunited with his long lost father Li, voiced by Bryan Cranston. The happy reunion doesn’t last long when deceased Master Oogway’s power hungry rival Kai, voiced by J.K. Simmons, returns to take revenge by erasing Oogway’s legacy. Po, Master Shifu (voiced by Dustin Hoffman), and the Furious Five must protect China from Kai’s rampages. When reinforcement is needed, Po must learn who he really is as a panda to find his true inner power to defeat Kai. Kids are sure to laugh at the slapstick humor. There are even a few hidden adult jokes for the parents’ viewing pleasure. The action is toned down a bit from Kung Fu Panda 2. Instead, the third refocuses on the original film’s message, which was finding yourself and learning to believe in your abilities. Directors Alessandro Carloni and Jennifer Yuh were able to supply vibrant visuals that were mesmerizing for the eye. The plot was easy follow and even had a bit of a twist at the film’s climax. Along with that, the voice acting from leads Jack Black, Bryan Cranston, J.K. Simmons and Dustin Hoffman were all spot on. The film had good pacing and never seemed to drag. One hour and thirty-five minutes seemed like an appropriate length for the film. Overall, Kung Fu Panda 3 is a great family movie that all ages will enjoy. The film brings excitement, action, humor, suspense, and a sense of family and belonging. The idea of finding yourself and what makes you special is the biggest take away. If you’re planning a family movie night, I recommend Kung Fu Panda 3.